Unfortunately Cafe Rappa has closed permanently closed. Please let me know if it updates. Thank you. Cafe Rappa is a charming little vegan cafe in Nakano, about 20 minutes by train from Shinjuku Station. 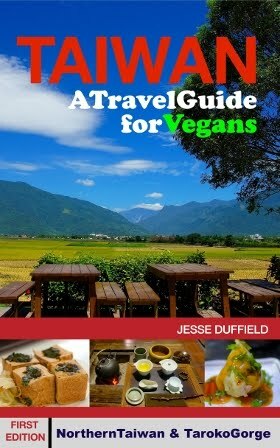 It features a pleasant, relaxing interior and delicious vegan food, at very reasonable prices. I arrived quite late, and the helpful English-speaking owner suggested I get the curry plate, which was a delicious meal and a great deal at only 900 Yen. The menu is only in Japanese, but the owner was happy to explain it to me in English. This two-curry set was delicious, and a great deal at only 900 Yen. Cafe Rappa serves a variety of hot, cold and alcoholic drinks. I had a coffee alternative (I think it was Inca) made with hot soymilk, cappuccino style. It was delicious. The owner is clearly passionate about healthy food. If you're in or around Nakano or Shinjuku I highly recommend Cafe Rappa for dinner, or an evening hangout. It's also a good option for a meal if you're in Tokyo late (other options include Vege Herb Saga, Nagi Shokudo and Pure Cafe). Tue - Sat: 11:30AM - 10:00PM. It's about a five minute walk from Araiyakushimae Station on the Seibu Shinjuku line. You'll probably need to take (at least) two trains, but it's worth the effort. This looks absolutely delicious - two curry sets!